CAPTION: The Firth of Forth railroad bridge is Rosyth's answer to New York's Verrazano-Narrows and San Francisco's Golden Gate. The massive steel-truss bridge is 2.5 km long and opened in 1890. Rosyth (the "y" is pronounced as a long "i") is the newest of Edinburgh's ports. 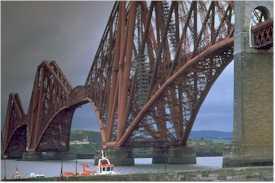 It's located on the Firth of Forth, 30 to 45 minutes from downtown Edinburgh by shuttle bus or public transportation. Rosyth is primarily a cargo port, although Superfast Ferries offers a daily 17½-hour car/passenger service between Roysth and Zeebrugge. During our visit on the Silver Whisper, the area around the pier was littered with piles of coal, stacks of lumber, and huge cable spools. Passenger facilities consisted of a steel building with a metal detector and a handful of friendly port employees. Use this site's route map and timetables to find a public bus connection if your cruise line doesn't offer free shuttle buses to Edinburgh (as Silversea Cruises does), or if you're a foot passenger on the Superfast ferry. Also see the transportation information at Superfast Ferries.